Excavation work at a location where the underground ducts are unknown. - Utility Locating - Case studies in ground and concrete detection and inspection - Géoradar Détection inc.
Case studies : Excavation work at a location where the underground ducts are unknown. Our firm proposes a professional, methodical and in-depth investigation taking advantage not only of our experience and our know-how, but also many techniques and locating instruments such as passive and active electromagnetic locator,high frequency, medium frequency and low frequency ground-penetrating radars,And an acoustic detection instrument - a slightly higher cost. 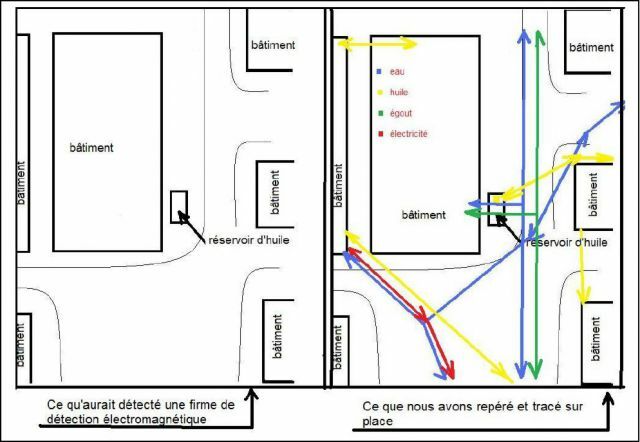 The owner called for our services, and a comparison is shown of some areas of the site comparing the underground utilities we found and those that a detection firm using only electromagnetic detection would have found. If you had to excavate on this site, which of the 2 detection firms would have been the most expensive? © 2017-2019 Géoradar Détection inc. - All rights reserved. | Web design: Thrace Graphistes Conseil inc.